The original Hash House, starting location for the earliest hash runs. The Missoula Hellgate Hash House Harriers are a local chapter of the international Hash House Harriers, founded in Kuala Lumpur, Malaysia in the early 1930s. 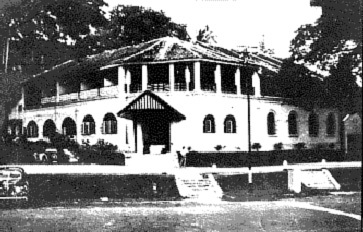 The name “Hash House” was the mildly derogative nickname given (for its unimaginative, monotonous food) to the Selangor Club Chambers, by the British Civil Servants and businessman who lived and dined there. Originally, the ground floor housed the main Selangor Club dining room, and between the two World Wars it became a social center of the times, used regularly for lunch time meals by the members who worked in the immediate vicinity. Situated close to and behind the present Selangor Club, it’s function changed after independence and it became a key office for the local Water Board, as it was the place where all Kuala Lumpur (K.L.) residents came to pay their water bills. Sadly, it gave way to the relentless march of time around 1964, being bulldozed to the ground under the north-bound lane Jalan Kuching. The buildings housing the original stables and servants quarters are still in existence. The idea about hashing by chasing paper was not new to Malaya in 1938, as there had been such clubs before in Kuala Lumpur and Johore Bahru, and there were clubs in existence in Malacca and Ipoh (the Kinta Harriers) at the time. “Horse” Thomson (one of the KLH3 founding fathers) recalled being invited on a run, shortly after his arrival in Johore Bahru in 1932, which chased a paper trail and followed basic Hash rules every week but was so magically organized that it had no name. The club flourished in the early 1930’s but is believed to have died out around 1935. The other branch of our ancestry comes from Malacca, where A. S. (‘G’) Gispert was posted in 1937 and joined a club called the Springgit Harriers, who also operated weekly under Hash rules and are believed to have been formed in 1935. Some months later, ‘Torch’ Bennett visited him and came as a guest on a few runs. It is not clear that the club actually had a name at the very beginning, but Gispert is credited with proposing the ‘Hash House Harriers’ when the Registrar of Societies required the gathering to be legally registered. “Torch” Bennett technically missed being a founder member, because he was then on leave, bout on his return he introduced the first necessary organization – a bank account, a balance sheet and some system. More importantly, he seems, with Philip Wickens who joined later in 1939, to have helped to keep things going immediately after the war. The founding members were all British, although Gispert was actually Spanish in origin, his parents having migrated to London some time before he was born. Extraordinarily both he and Bennett were accountants, as were Paul Barnard and Jack Bridewell who made a significant contribution to our activities of later years. Some Hash psychiatrist should investigate where this work leads to extreme forms of escapism. The HHH duly celebrated it 100th run on 15 August 1941, but only 17 runs later was forced into temporary hibernation by the arrival of the Japanese. Post World War II, it was nearly 12 months before the survivors reassembled. “Torch” Bennett put in a claim for the lost hash mugs, a tin bath and two old bags, on the fund set up with the proceeds from confiscated Japanese property and run No. 1 was a trot around the race-course in August, 1946. Subsequent to the 1,000th post war run the celebrations surround it were considered to be such a success that the 117 official pre-war runs were added to the total as we could celebrate the 2,000th run as soon as possible. With the advent of the Emergency in 1948, the Hash was automatically in bad official odor, as their activities were generally illegal in terms of the curfew imposed on most of the areas surround Kuala Lumpur and in the years 1948-51, they maintained a precarious existence at best. The turn round came with the famous bandit incident at Cheras. This has been widely misreported, but what actually happened was that below where the Lady Templer Hospital is now, in an area that was then rubber and belukar, the Hares on a darkening and rainy evening came across some men wrapped in ground sheets sleeping on the ground. The following pack found the bandits on their feet but someone, in the general confusion nobody got hurt. One member ran to Cheras Police Station and raised the alarm; the army laid ambushes on tracks leading out of the area and first thing the following morning bagged three bandits trying to break out. One of them was found to have a substantial price on his head and the bounty was shared among the non-government employees on the run (government servants were not allowed to participate in such rewards). Other colorful incidents related by Cecil Lee, include how ‘Torch’ Bennett once nearly drowned in quicksand, and how on one memorable occasion the erstwhile unathletic ‘G’ was actually leading the pack: sadly his moment of glory was short lived as the paper trail turned to be false. Swimming would seem to be an unofficial prerequisite to all Hashmen too, for Cecil remembers having had to swim across a mining pool in order to get home after being lost on one occasion, and on another it is reported that several Hashmen ran in to a stream where bathed some unsuspecting Malay maidens. The girls screamed; their menfolk came hurtling to the rescue with the unsheathed parangs flashing, and the errant Hashmen broke land speed records in the eagerness to clear the scene. The first attempt at an Interhash get-together was the K.L. 1,000th post-war run in 1966, and the spectacular 1500th run in 1973 when attendance was something over 300. Interhash 1978 in Hong Kong broke new ground with an attendance around 800; Interhashes 1980 and 1982 were credited with 1,200 – 1,300; Interhash 1984 with rather more Interhash 1986 broke the 2,000 barrier with 2,143. Attendance at Bali for Interhash 1988 was reported to bet between 2,600 and 2,700. Interhash 1990 in Manila was affected by the then current state of emergency in the country, but nevertheless some 1,600 intrepid Hashers were let loose in Manila and survived to tell the tale. At the rate the HHH is growing, our millionth member should only be 5 or 10 years down the road! The HHH is unique, ‘green’, happy and enjoyable phenomenon, and all hashers worldwide are heir to this heritage. It was therefore been proposed that we resurrect the ‘Hash House’ in K.L., so that all HHH inheritors, from any continent, may have a place of their own to meet, eat, drink, stay and generally relax. It would be the Home of the Hash, and all hashers would be eligible for membership and all Hash Chapters could its facilities. The focus of the initial work has been on land acquisition and, though the original site is now under Jalan Kuching, an alternative site, very close to the original, in beautiful surroundings, is currently under discussion with the K.L. municipal authorities. Today there are thousands of chapters worlwide and several hundred in the United States alone. Most mid to large size cities have a Hash chapter. All are a member of this worldwide fraternity and social club we call hashing! Written in 1992 by Mike Lyons from the copious research material prepared by John Duncan. Transcribed in 1994 by Tom “Self-Executing Officer” Moore, On-Sec, Boston H3, and edited by Chas. “ZiPpY” Baumerich, On-Sec, Pikes Peak, H4. Join us for our next hash! Copyright © 2013 - 2019 Missoula Hellgate Hash House Harriers. All rights perverted.